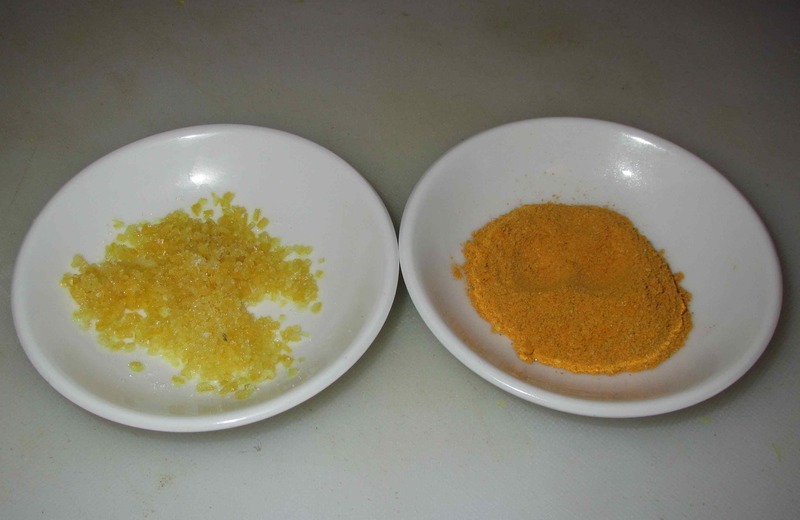 First, mix together the lemon zest, sugar and salt and, in a separate dish, combine the turmeric, cardamom, cayenne and amchoor. 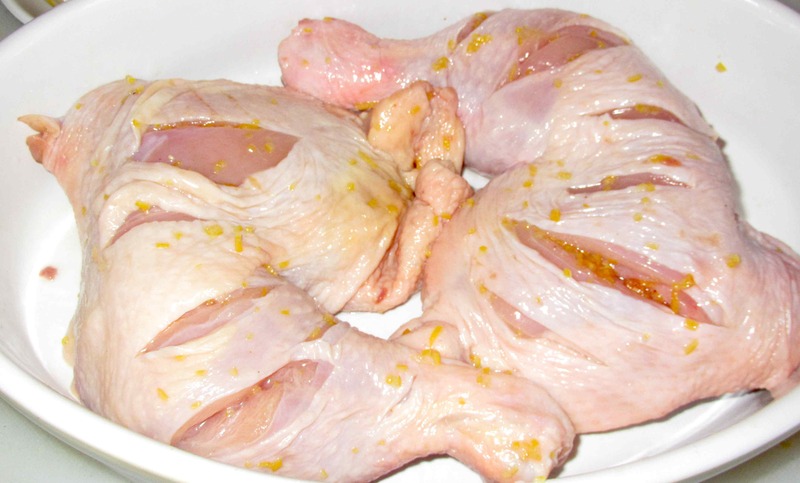 Make several slashes in the skin and flesh of the chicken pieces. Rub them first with the lemon juice and then with the lemon zest mixture, making sure you get plenty into the slashes and under the skin. Set aside for a good 30 minutes or so. Now rub the pieces well with the spice mixture and, again, work some under the skin and into the slashes. 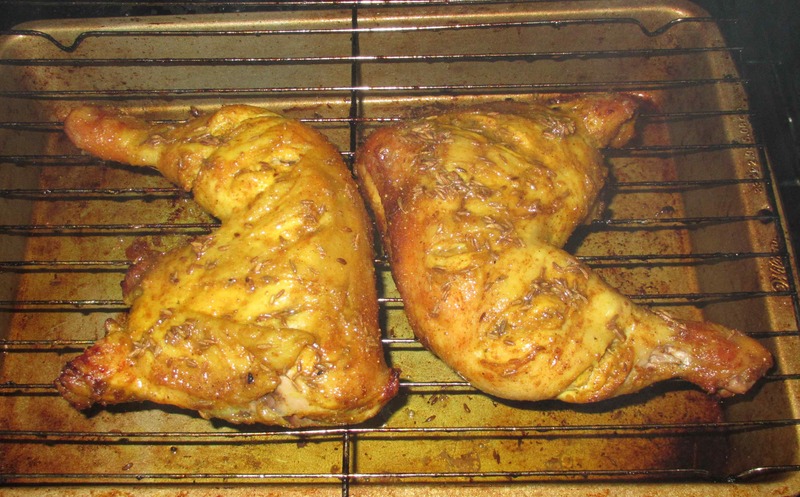 Cover and refrigerate for several hours, or overnight, to allow the flavor to penetrate. 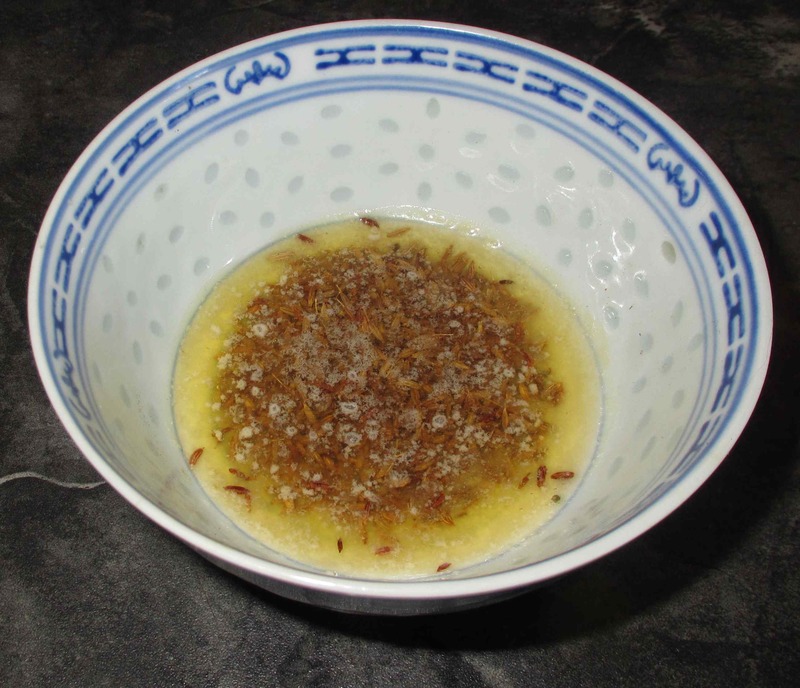 Pre-heat your oven to 450 degrees and, while it is warming, toast the cumin seeds in a dry pan until they give off their fragrance and are just beginning to brown. Add the butter and, when it is melted remove from the heat and keep warm in a small bowl until needed. 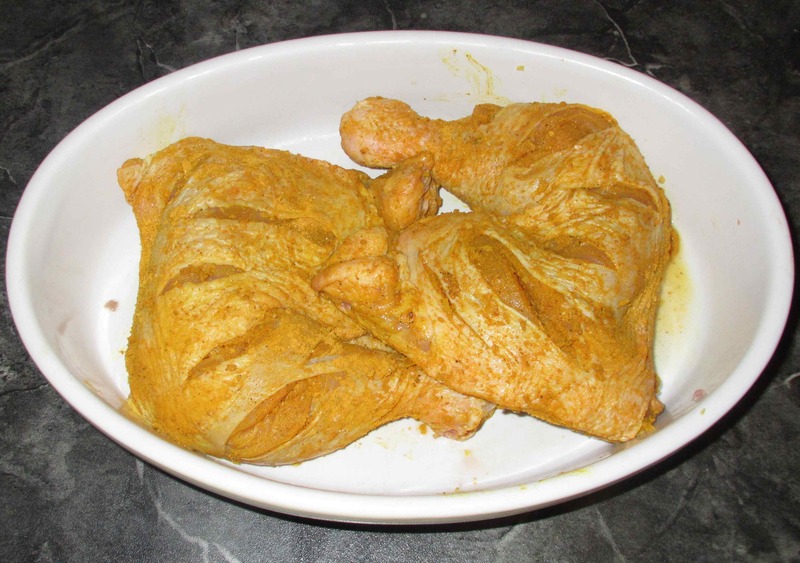 Finally, bake the chicken on a wire rack, turning once during cooking, and baste several time with the butter, making sure that some of the cumin seeds adhere to the chicken skin. 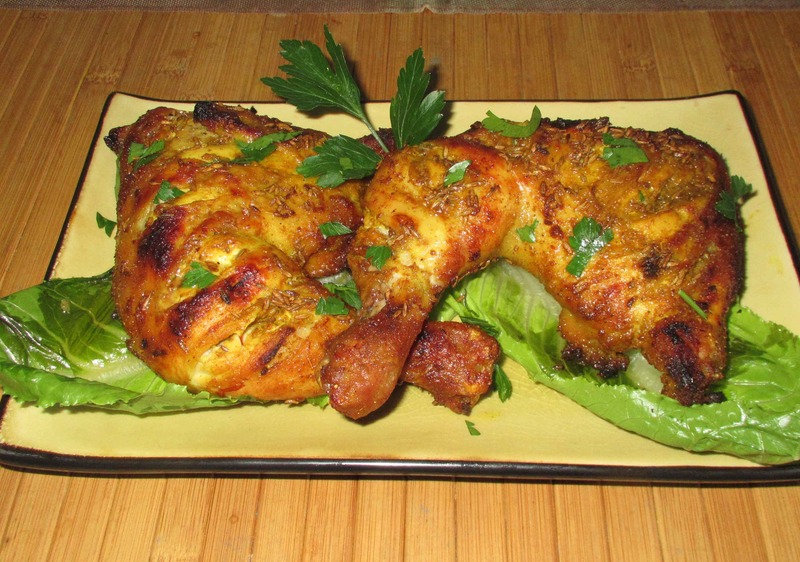 You will need to bake it for about 30 minutes or so and, if you like, you can give it a quick blast under the broiler to give it that nice ‘Tandoori’ look. Allow to rest for 5 minutes and then serve. Well, this was very tasty, and the chicken was nice and moist. I liked the hint of lemon and cumin but I was a bit disappointed that the cardamom really didn’t come through. Unfortunately, I was a bit cautious with it as this spice is very aromatic and can easily overwhelm dishes if one is not careful. Next time, I would use half as much again, at least. Still, this made a lovely supper and the second piece that I saved for lunch the next day was just as good. I love Cardamom, but my husband hates accidentally biting into them whole. I never new there was Cardamom powder. That would solve my problem. This dish looks very good. I guess it might be good to use the same recipe but spread out over 4 or 8 pieces of chicken or a kilo of drumsticks? As always you are one of my fave foodie blogs!! Such dedication and commitment that I am finding hard to do for my own blog at the moment. I agree, he’s a cunningly clever foodie… I’d rather cook his recipes than blog! MMM on Wednesdays I drive out to the CSA for my share of veggies and free range meat, I’ll have to pick up a few chicken legs and try this! Looks so yummy. Lately I’ve been buying whole chicken leg & thigh pieces. One can never run out of ideas on how to prepare legs and thighs. So yours is another; I will definitely make this recipe. Thanks! Unaccountably, it is more expensive up here to buy a whole chicken and cut it up at home than it is to buy pieces!! This sounds really good. I like cardamom but I probably would have been afraid of adding too much as well. Thanks for the tip on the amount of spice to add! Excellent looking chicken. I love the high colour. Sounds very good. I appreciate how you experiment with flavors and your feedback at the end of your post is so honest. 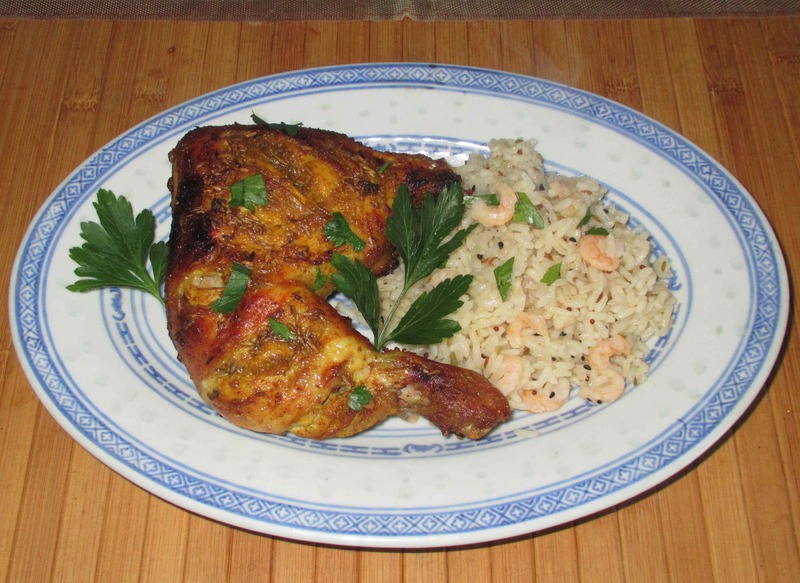 Great looking chicken dish. This looks really, really good. I need to start playing around with amchoor more! I only use it once in a while really, but it definitely has its uses.